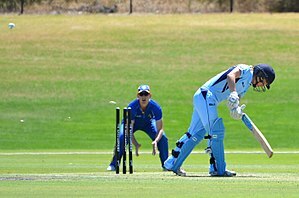 NSW Breakers all-rounder Nicola Carey is bowled for a golden duck by ACT Meteors all-rounder Marizanne Kapp. Note the ball, and the flying bails, one of which has broken into two pieces. Carey later took three wickets (two bowled, one caught) during the Meteors' innings. In cricket, a dismissal occurs when a batsman's period of batting is brought to an end by the opposing team. It is also known as the batsman being out, the batting side losing a wicket, and the fielding side taking a wicket. The dismissed batsman must leave the field of play permanently for the rest of their team's innings, and is replaced by a teammate. This continues until the end of the innings, which is often when 10 of the 11 team members are dismissed - as players bat in pairs, when only one person is undismissed it is not possible for the team to bat any longer. This is known as bowling out the batting team. The most common methods of dismissing a batsman are (in descending order of frequency): caught, bowled, leg before wicket, run out, and stumped. Once dismissed, a batsman cannot score any more runs in that innings. Thus dismissing batsmen is a way for the fielding side to control the runs scored in an innings, and prevent the batting side from either achieving their target score or posting a large total for the fielding side to follow in the next innings. Additionally, in Test and first-class cricket, it is usually necessary for the side fielding last to dismiss ten players of the opposing team in their final innings to achieve victory (unless one or more of the batsmen have retired hurt or absent and unable to take the field). By convention, dismissal decisions are handled primarily by the players – thus if the dismissal is obvious the batsman will voluntarily leave the field without the umpire needing to dismiss him. If the batsman and fielding side disagree about a dismissal then the fielding side must appeal to the umpire who will then decide whether the batsman is out. In competitive cricket, many difficult catching and LBW decisions will be left to the umpire; if a batsman acknowledges that he is out in such cases and departs without waiting for the umpire's decision it is known as "walking", and regarded as an honourable but controversial act. A batsman can be dismissed in a number of ways, the most common being bowled, caught, leg before wicket (LBW), stumped and run out. An analysis of Test match dismissals between 1877 and 2012 found that 98.2% of the 63,584 Test match dismissals in this period were one of these five types. Much rarer are hit wicket, hit the ball twice, obstructing the field and timed out. The bowler is credited with having taken a wicket if the batsman is out bowled, LBW, caught, stumped, or hit wicket. If the ball is a no-ball, then the batsman cannot be out in any of these ways. The bowler is not credited with having taken a wicket if the batsman is run out, hits the ball twice, or obstructs the field; these dismissals may occur even when the delivery is a no-ball. The fielder is credited in the statistics with a dismissal if he takes a catch or a stumping (for a stumping this will necessarily be the wicket-keeper), and may be credited on scorecards for a run-out (although a run-out will not be credited to a player's statistics). If a bowler's legitimate (ie. not a No-ball) delivery hits the wicket and if at least one bail is completely removed from the top of the stumps, the striker (the batsman facing the bowler) is out (assuming the bail does not luckily land back in the stump's spigots). The ball can either have struck the stumps directly, or have been deflected off the bat or body of the batsman. However, the batsman is not Bowled if the ball is touched by any other player or umpire before hitting the stumps. The batsman is not out if the bails remain on the stumps. Bowled takes precedence over all other methods of dismissal. What this means is, if a batsman could be given out both Bowled and also for another reason, then the other reason is disregarded, and the batsman is out Bowled. Between 1877 and 2012, this method accounted for 21.4% of all Test match dismissals. If the batsman hits the ball, from a legitimate delivery (i.e. not a No-Ball), with the bat (or with the glove when the glove is in contact with the bat) and the ball is caught by the bowler or a fielder before it hits the ground, then the batsman is out. "Caught behind" (an unofficial term) indicates that a player was caught by the wicket-keeper, or less commonly by the slips. "Caught and bowled" indicates the player who bowled the ball also took the catch. Caught takes precedence over all other methods of dismissal except Bowled. What this means is, if a batsman could be given out both Caught and also for another reason (except Bowled), then the other reason is disregarded, and the batsman is out Caught. Between 1877 and 2012, this method accounted for 56.9% of all Test match dismissals, with 40.6% caught by fielders, and 16.3% caught by the wicket-keeper. Between 1877 and 2012, this method accounted for 14.3% of all Test match dismissals. If a fielder uses the ball to remove the bails from either set of stumps whilst the batsmen are running between the wickets (or otherwise away from the crease during the course of play), then the batsman (striker or non-striker) is out. The batsman nearest the set of stumps from which the bails were removed, but not actually in safe territory, is given out. If the batsman has any part of his body or his bat (if he is holding it) on the ground behind the line of the crease, then he cannot be run out (except if both batsmen are on the same side of a crease) i.e. on the line is considered as out; frequently it is a close call whether or not a batsman gained his ground in this way before the bails were removed. (The difference between stumped and run out is that the wicket-keeper may stump a batsman who goes too far forward to play the ball (assuming he isn't attempting a run), whilst any fielder, including the keeper, may run out a batsman who goes too far for any other purpose, including for taking a run.) If the bails have already been removed, a fielder can remove a remaining stump by pulling it out or hit out the stump (ensure that the stump is fully out of ground) from the ground with the ball in their hands. A fielder can also "remake" the stumps and remove a stump/bail to effect a run out. If a batsman has a runner due to injury/illness there is the danger of being run out due to confusion between the three (or four in very rare circumstances) batsmens/runners on the field, all of whom must be safe in their crease when the wicket is broken and also at the correct end of the wicket. For example, a batsman who is batting with a runner should always be behind the crease at the striker's end whilst the ball is live. If he forgets that he has a runner a quick minded fielder is able to break the stumps at the striker's end to run him out – even if he finds himself safely behind the crease at the bowler's end. A special form of run out is when the batsman at the non-striker's end attempts to gain an advantage by leaving the crease before the next ball has been bowled (a common practice known as "backing up", but against the laws of cricket if the non-striker leaves his crease before the bowler has released the ball). The bowler may then dislodge the bails at his/her end without completing the run-up and dismiss the batsman. This form of run-out is called the Mankad (the dismissed batsman is said to have been "Mankaded"), in reference to Vinoo Mankad, the first bowler to dismiss a batsman in this manner in a Test match, running out Bill Brown in 1947. With changes in the Laws of Cricket, a bowler cannot Mankad a batsman once they reach the point in their delivery where they would normally release the ball. It is considered good etiquette to warn a batsman that he is leaving his crease early, before attempting a Mankad run out on a subsequent ball. Between 1877 and 2012, this method accounted for 3.5% of all Test match dismissals. If the striker steps in front of the crease to play the ball, leaving no part of his anatomy or the bat on the ground behind the crease, and the wicket-keeper is able to remove the bails from the wicket with the ball, then the striker is out. A stumping is most likely to be effected off slow bowling, or (less frequently) medium-paced bowling when the wicketkeeper is standing directly behind the stumps. A stumping is the only method of dismissal, from a wide delivery that the bowler gets credit for on the scoreboard. As wicket-keepers stand several yards back from the stumps to fast bowlers, stumpings are hardly ever effected off fast bowlers. But a keeper may throw down the stumps and the batsman is still out stumped if he is out of his ground, but not attempting a run. Similarly, the ball can bounce off a keeper (but not external non-usual wicketkeeping protective equipment, like a helmet) and break the stumps and still be considered a stumping. Stumped takes precedence over Run out. What this means is, if a batsman could be given out both Stumped and Run out, then Run out is disregarded, and the batsman is out Stumped. Between 1877 and 2012, this method accounted for 2.0% of all Test match dismissals. Only two players in Test history have ever been given out in this manner: Marvan Atapattu (for 201) and Mahela Jayawardene (for 150), both in the same innings of the same match playing for Sri Lanka against Bangladesh in September 2001. Apparently, this was done in order to give the other players batting practice, but was considered unsportsmanlike and drew criticism. In May 1983, Gordon Greenidge of the West Indies retired out on 154 to visit his daughter, who was ill and who died two days later; he was subsequently judged to have retired not out, the only such decision in Test history. There are numerous other recorded instances of batsmen retiring out in first-class cricket, particularly in tour matches and warm-up matches; since these matches are generally treated as practice matches, retiring out in these matches is not considered unsportsmanlike. In 1993 Graham Gooch, immediately after completing his hundredth first-class century with a six, retired on 105. A player who retires hurt and does not return to bat by the end of the innings is not considered out for statistical purposes, though, as substitutes are not permitted to bat, the impact on play is effectively the same as if they had retired out. If the batsman "hits" the ball twice, he is out. The first hit is considered to be if the ball has struck the batsman or his bat, whilst the second "hit" has to be an intentional and separate contact with the ball – again not necessarily using the bat. The batsman may hit the ball a second time with his bat or body (not a hand not in contact with the bat) if it is performed to stop the ball from hitting the stumps. It is therefore possible to be out hitting the ball twice, whilst not actually hitting the ball with the bat at all. A batsman can hit the ball with any part of his body and bat except his hands. An incoming batsman is “timed out” if he willfully takes more than three minutes to be ready to face the next delivery (or be at the other end if not on strike). If a not out batsman is not ready after a break in play, they can also be given out timed out on appeal. In the case of extremely long delays, the umpires may forfeit the match to either team. So far, this method of taking a wicket has never happened in the history of Test cricket and there have been only five occasions in all forms of first-class cricket. Before the amendments of the Laws in 2017, there was a separate dismissal type of Handled the ball which is now covered by Obstructing the field. If the batsman touched the ball with a hand not in contact with the bat for any purpose other than to prevent themselves being injured or, with the approval of the fielding team, to return the ball to a fielder, he was out on appeal. It was considered good etiquette for the fielding team not to appeal if the handling of the ball did not affect the play of the game, although there have been occasions when this etiquette was ignored. Only seven batsmen have been out handled the ball in the history of Test cricket, and two in One Day Internationals. ^ Derriman, Philip (6 October 2004). "To walk, or not to walk, that is the question". The Sydney Morning Herald. Retrieved 19 December 2008. ^ a b c d e f "Analysing Test dismissals across the ages". espncricinfo.com. ^ "HowSTAT! Test Cricket – Leonard Hutton – Analysis of Batting Dismissals". howstat.com. ^ "HowSTAT! Test Cricket – Desmond Haynes – Analysis of Batting Dismissals". howstat.com. ^ "HowSTAT! Test Cricket – Stephen Waugh – Analysis of Batting Dismissals". howstat.com. ^ "Law 32.2 – Bowled to take precedence". MCC. Retrieved 22 April 2019. ^ "Law 33.5 – Caught to take precedence". MCC. Retrieved 22 April 2019. ^ "Law 39.1.2". MCC. Retrieved 22 April 2019. ^ "The Tribune, Chandigarh, India – Sport". tribuneindia.com. ^ "5th Test: West Indies v India at St John's, Apr 28 – May 3, 1983 – Cricket Scorecard – ESPN Cricinfo". Cricinfo. ^ "Join the club". Cricinfo. ^ "Pakistan gain slender lead after record stand". Cricinfo. ^ "cricket – sport". Encyclopædia Britannica. ^ "Out of time". Cricinfo.